Many have tried, and most have failed. No one told Bruce Pearl and Auburn, though. The Tigers (29-9) outran and outscored the Tar Heels (29-7) to end this season’s edition of Carolina basketball in a 97-80 blowout that never really seemed close. Auburn, led by sophomore forward Chuma Okeke, knocked down 17 3-pointers, a UNC opponent record in the NCAA Tournament, and scored 19 points off 14 forced turnovers. Carolina seemed to be playing catch-up from the offset against an Auburn team that entered the game with a 10-game win streak, the best of any team still alive in the Big Dance. A big part of that recent success was red-hot shooting from beyond the arc. After a 43 percent performance from deep in the previous round against Kansas, the popular sentiment was that the Tigers were bound to cool off eventually. It seemed that way in the first half, as Auburn made only five 3s and held a two-point halftime advantage thanks to offensive rebounding and second-chance points. But in the second frame, the Tigers looked like the team that capped off an SEC Tournament championship with a blowout of Tennessee. The Tigers were 12-18 from deep and scored 56 points in the second half to put away the Tar Heels and give Williams his earliest loss as a No. 1 seed. His fellow senior, as he always did, reflected more on his own play. Now, the focus shifts to freshmen Nassir Little and Coby White, two potential first-round picks who must decide if they wish to cash in as NBA players or return to school to wash the bad taste out of their mouths. For those that don’t have a decision, the loss hurts that much more. 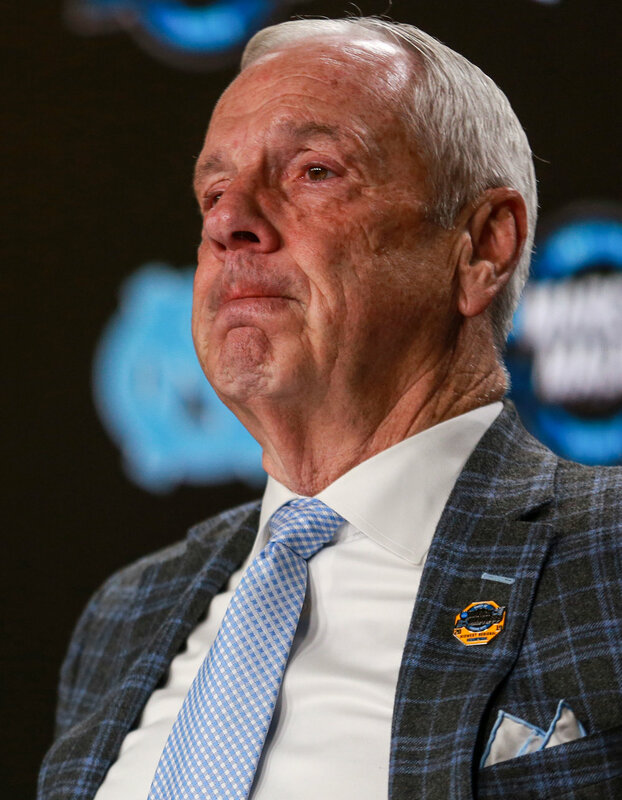 Seniors Williams, who watched the waning seconds of his final game in tears, and Maye end their careers as the third most-winningest class in UNC history. Cam Johnson, an All-ACC graduate transfer who made two 3-pointers to finish with the second-most in a single season in UNC history, will head to the NBA draft as another potential first round pick whose 46.3 percent from deep catapulted him up draft boards. And for the rest, plenty of questions abound. Like how the team that depended the most on the 3 of any Roy Williams team shot only 25 percent from deep and were beaten thoroughly at their own game. And how White, a laser-quick point guard seemingly made to run the Carolina fast break, regressed to his freshman mistakes in the biggest game of the year, going 4-of-15, including 0-7 from 3. And especially how UNC’s defense, a component that had seemingly ironed out its early-season issues to finish 15th in KenPom’s defensive efficiency rankings, was exposed for its flaws by a perfectly-executed perimeter attack. For now, though, there is mostly shock at such an abrupt ending. Because the rule wasn’t just broken.